We regularly write and talk to customers about the positive impacts of videoconferencing for different businesses. However, we also often get asked about how we use our own products here at Videxio. 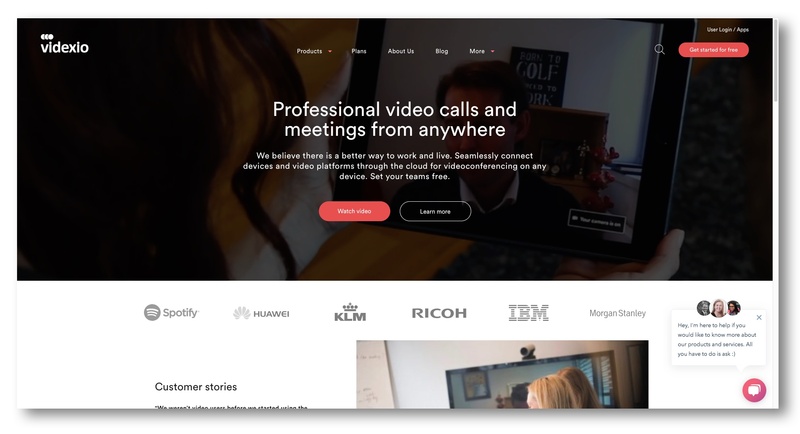 So, to give you some insight into how live video collaboration helps to shape our approach to work every day in Videxio, we’ve shared our experiences of completing the recent project to update and rebrand our company website. In the first half of 2017, we undertook a major revamp of videxio.com, which involved a great deal of planning and cooperation with different stakeholders inside Videxio, as well as our external web development agency. We didn’t just want to revamp the existing website, we wanted to create a totally new site from scratch. There were several reasons for taking this decision, rather than the quicker and less expensive route of simply updating the existing site. Chief among them was the fact that the old site had been built when we were a much younger company. During the intervening years, the core market for cloud video has grown and as a result so has our potential audience, with the different types of businesses considering professional videoconferencing growing exponentially as innovations in videoconferencing and cloud technology have made it accessible to much larger number of businesses. As an added incentive, we had recently undergone a process of updating our visual identity inside our products and services, so we felt it was important to update our company website to reflect these changes. Updating an website, or adding extra pages can take some time, but for anyone who has ever worked on a similar project, you’ll be aware that building a new website from the ground up can be a very labor intensive process. And in many businesses, a new website is an extra project that needs to handled on top of normal day-to-day activities and tasks. A priority for us was to find a way of working efficiently with all the different moving parts, with internal communications and decision making, and especially communicating with our web agency. Luckily, we had a clear idea of why we wanted to undertake the project with concrete objectives that helped us build a robust plan to make sure we hit the ground running. However, we didn’t simply rely on our own belief that changes in the market and the evolution of our service to set our objectives. We also used a range of data from our old site to help inform decisions about the new one. We combined interviews with users with data from Google Analytics to form a picture of where we wanted to go. This can sounds like a lot of extra work when you’re already busy and you limited resources, but you don’t necessarily need to interview enough people to draw statistically significant results. 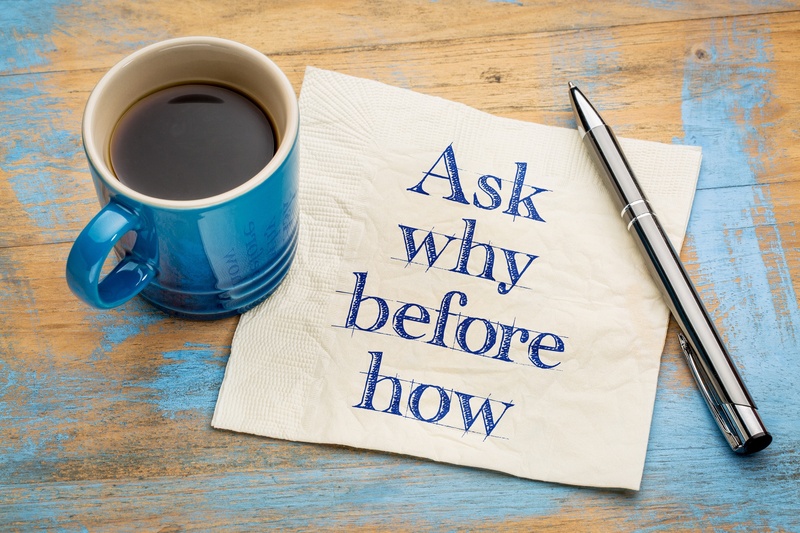 It’s quite surprising when conducting interviews, that with a selection of well-thought questions, even brief interviews with a handful of people will likely throw up some obvious patterns and similarities in their feedback. One great advantage we had was being able to interview users face-to-face on video. Of course, there’s often a limited supply of people you can talk to in person, so being able to use video helped us cast our net wider without using any extra time or resources. It was really easy at the end of a scheduled video meeting to very politely ask for five or ten minutes at the end to ask a couple of short questions. By sharing the screen with the interviewees we could really pinpoint the elements of the page they were talking about. In effect, we were able to see the site through the eyes of the user in a way that online surveys and email questionnaires would not be able to offer. For the first time you meet there’s face-to-face, for everything else there’s video. Whilst we chose to partner with a locally-based agency for the web development, we were under no illusions that we would be able to spend hours and hours in the same room hashing out every minute detail. With offices at opposite sides of the city and other projects on the go at the same time, we knew that trying to plan in large chunks of time together beyond the essential moments would kill our ability to be efficient alongside our other priorities. Whilst we planned in physical meetings at important stages of the project, we wanted to keep the time we would be going between various meetings and workshops to a minimum, as even 45 minutes each way traveling between offices is big juicy bite out of the work day. And if we multiplied that those 45 minutes x2 for each time we needed to meet then we knew that we could save a huge amount of time and be far more efficient if we could replace the majority of physical meetings with video instead. For our first workshop we knew that it made sense to kick things off in-person and we scheduled a meeting in-person to last several hours. But after that, we only met up physically once more during the project, not because we couldn’t find the time, or because there were no major decisions to make, but because we simply didn’t have to. 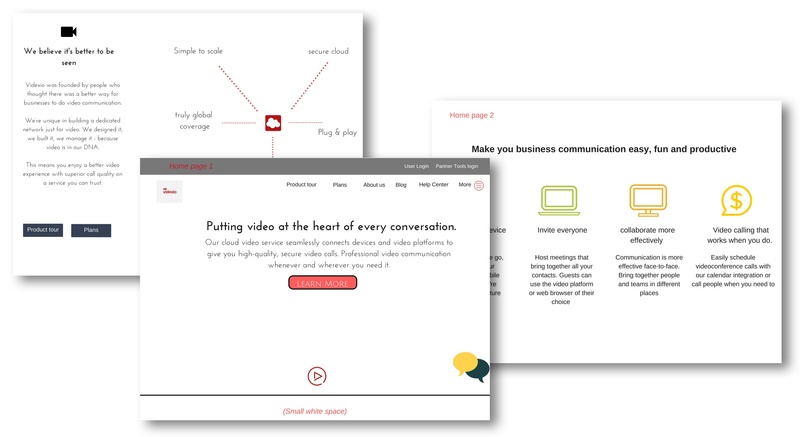 By using Basecamp as a project management tool to manage tasks and communicate non-essential items, we relied on video to support all our workflows whenever we required collaboration with the web agency and designer. Some very early wireframes of the new site. Knowing we would use video altered our approach from the outset, as even in small ways, we could work with less friction. As an example, when creating the wireframes to give the designer, it’s common to simply offer rough sketches drawn by hand, which are then discussed together face-to-face. Instead, we created digital versions using Canva, a simple online “drag ‘n’ drop” style design tool (you could just as easily use PowerPoint instead). It was hugely useful in the early design phase useful to have a digital file we could share on screen and refer back to whenever we needed to rather than having to dig out scraps of paper with ever growing amounts of scribbles. As is common in this type of project we had gathered a list of web pages for our designer to reference as examples of designs we loved during our planning. However, whilst we started off with a predefined list of examples, it always took us to new places during a video call as the designer could respond live to show us alternative examples and develop our ideas faster. We would never have achieved this kind of flow if we had simply exchanged emails of static lists of websites we quite liked back and forth. Seeing the design come to life. As most of our non-essential communications happened via a project management tool, so we relied on video mostly for when we required actual collaboration. In total we spent just over 40 hours on video for just this project. The longest single time for one day was nearly nine hours on video. But it wasn’t only to discuss changes or make decisions. What it really was about was watching the design come to life in front of us. By sharing the prototype on the screen we were able to create a very interactive process with the designer. As we altered individual elements live we could place individual changes in the overall context of the whole design. Normally we would had to have left comments or sent emails describing changes we wanted to make, then wait for them to be implemented, with changes happening in bulk. Instead we had a very flexible workflow where we could identify and update individual elements and make decisions very rapidly. We were able to watch the site take shape in real-time and see the effect of individual changes rather than waiting for the designer make lots of little changes in between meetings . Sometimes the smallest changes made the biggest differences to the look and feel of the project and it was liberating to have the ability to collaborate on so many details whilst feeling like we were making the most of our time. Putting together the final touches. No website project in history has ever been executed perfectly, with even the most carefully laid plans needing a rethink as ideas develop or change direction, and we were no exception. But the heart of our original design is in the new videxio.com and because we were able to communicate very efficiently, changes felt easy to incorporate rather than leading to stress-induced meltdowns. And Whilst the majority of our video use did cover the vital design phase, we did go back to video for the last few moments before the moment of truth and hitting the big red button marked “launch”. But this mostly to help iron out the final kinks such as minor bug fixes before we went live. Otherwise, the launch of the new site was, by website project standards we’ve experienced in the past, very non-eventful! Beyond overseeing launch that was relatively plain sailing, the results so far have been very promising. Our data indicates we have created a clearer user journey with user feedback indicating people are now able to find the information they’re looking for more easily.